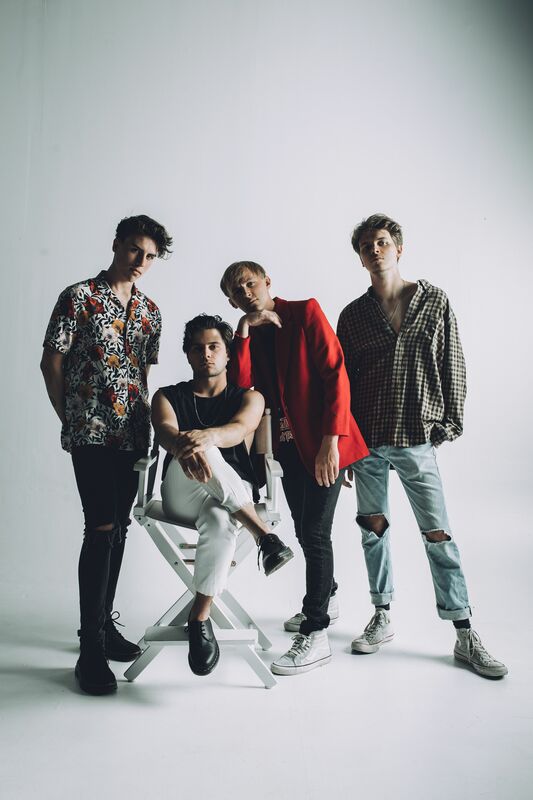 Meet the Jersey boys of the pop-rock outfit The Stolen! They have come a long way since they were ripping covers of classic rock anthems and Motown tunes at their elementary school’s Fifth Grade Fun Night. The band consists of vocalist/guitarist Dominick Cuce, guitarist Rob Chiarappa, bassist Kevin Smart and drummer Mike Chiarappa. Before they honed their songwriting skills to craft inviting pop hooks and kinetic guitar melodies, they started off as a group of friends exploring their love of music by learning and performing AC/DC songs together. Almost 10 years later, after playing countless shows locally, the band released Adults in 2013, which they recorded with producer/engineer Jesse Cannon (Animal Collective, The Misfits). This also marked their first release with bassist Kevin Smart. In 2015, they reached a turning point with the release of their single “Chardonnay,” recorded with producer Paul Levitt (All Time Low, Have Mercy). This began a transition from their pop-punk beginnings to put more focus on their pop sensibilities. 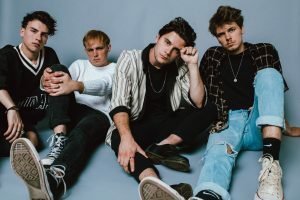 Spring of 2016 marked the arrival of their self-released, self-produced EP I’m So Dead, showcasing their shift from a fast, loud pop-punk band to a more groove driven, pop-rock sound. It also landed them recognition from MTV who called the EP “the perfect pop-alt soundtrack to take you into the summer season.” They recorded it at Cannon’s New Jersey studio but produced and mixed the album themselves. Meanwhile, between recording stints, the band continued touring aggressively whether it be self-booked stretches with their peers, touring/performing with acts like Neon Trees, The All American Rejects, The Academic, Jake Miller, Punchline or even following Vans Warped Tour to reach new fans and compete to see who could sell the most CDs and merch. These efforts show the bands perseverance and hustle that they display on and off the road. Fragile Heart (released May 2017) is the band’s most collaborative effort to date and, once again, done with a DIY mentality with the drums and vocals being predominantly recorded from home. With Fragile Heart, The Stolen have accomplished something that sounds both familiar and comforting with an ’80s pop vibe that is simultaneously young, fresh and new. Their single “Overboard,” released February 2018 via Revival Recordings, which hit No. 21 on the iTunes Alternative Chart, perfectly illustrates where the band’s sound is going. We have been working on our record for the past few months, so we are just now wrapping it all up. Well like I said, we’ve been working on a record in which we will be releasing in a few months so we’re really excited for that. I think we are all really proud of how hard we went in 2018. We toured nonstop and released songs that we are really excited about. I actually made the same resolution! I enjoy reading as well, but is sometimes hard to find time. We’ve been a band for so many years, since we were kids. It was kind of natural for us to be in a band together, because we were always best friends who made music together. Growing up, we were mainly influenced by the music that our parents exposed us too. Obviously as we grew older, we began to explore more. We were playing shows every couple weeks opening up for bands from different states and that also exposed us to different sounds. Our hometown as a whole has been super supportive of what we do, so we like show the same amount of support towards the people we work with. We all play several instruments, so that really helps with the creative process. It’s also all about learning for us. We love to study/watch documentaries about other band’s creative processes as well. Growth is inevitable, whether that pertains to our sound or how we are as people. We aren’t the same band we were 2 years ago and we certainly aren’t the same band we were in 2013. One thing that remains the same is our friendship and willingness to learn every day. Let’s talk about your newest single, “Rooftop.” What was the inspiration of this song? What was it like working with Jake Miller on it? Rooftop was a concept that came to us when the shocking news broke that famed food critic Anthony Bourdain had taken his life. It’s about the suicide epidemic in our world that no one inadvertently talks about; the idea of suicide being glorified and massively publicized, yet it seems that nobody cares to try and prevent it. It’s a vicious cycle of people opening their phones and seeing yet another person who has taken their own life, and not understanding the damage that’s being done. The world is becoming a place where we not only are not looking out for one another, but we’re ignorant to reality, because all human contact is digital. Being that we are really good friends with Jake Miller, we felt that it made sense to have him on the record. Jake’s work ethic is incredible. We sent him the song and we received his vocal back the same day. Our new album will be out by late spring. We’ll be announcing more details within the coming weeks. This is a process that has evolved over the years. Earlier on, Rob would typically bring a song to us on acoustic guitar and we would all jam it on the floor. Lately, we’ve been sending ideas through our group chat late at night. We end up going back and forth for days on them. It is super fun and collaborative. We love to tour. Over the past couple years, we have been on the road more than ever. We love being able to connect with the fans and play in different cities each night. Although, we also enjoy being at home and creating. Finding that balance is always fun for us. Along with our new record, we will be announcing a tour for later this year. Our most recent tour was amazing. We toured with a bunch of different bands throughout the US. One of our favorites was definitely playing in Jersey with The Wrecks back in December. An ideal show for us is one where there is a mutual energy between us and the fans. We like to interact with fans during the show, so it is always great to have that connection during a live show. As a whole, we definitely recognize how social media can become overwhelming. That was essentially part of the concept behind Rooftop. People become so blind behind the screen. Our attention spans have become so short where we almost do not recognize the importance of an event. Society is always looking for the next thing to talk about. Although, we are the ones that are on our social media. We truly enjoy interacting with the fans. Twitter is a lot of fun for us because we can create dialogue easily. It is important to be present and recognize what is going on in the world or in our personal lives. Our songs talk about those experiences we go through and we dedicate to making our music as honest as possible. We enjoy substance as listeners, so that’s what like to put out. As a whole, we try not to get involved in politics publicly. This is always interesting because we listen to an abundance of music daily. Collectively, we agree that a collab with Bruce Springsteen or The Talking Heads would be awesome. We create honest music. For us, that is what is all about. It is an incredible feeling when a fan comes up to us and talks about how one of our records resonated with them and how it helped them in some way. No better feeling. We are working extremely hard on our new record and we are going to be touring a bunch this year. Keep an eye out!